Members of the rock group Guns ’N Roses have been ordered to stay in Chile until a probe is completed into why traces of cocaine were found in the clothing of one of the band members, police said Thursday. A court ordered an investigation after police said a tube of cocaine was found in an article of clothing when it was being cleaned in the hotel laundry in Santiago. The group had been scheduled to leave Chile for Argentina Thursday. 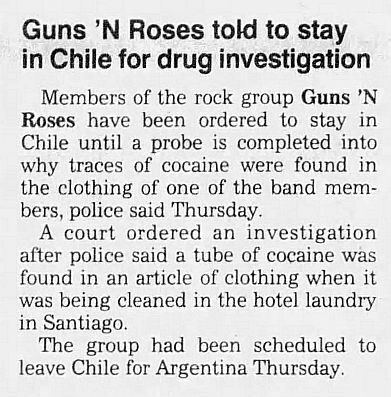 The members of Guns Ν’ Roses have been ordered to stay in Chile for an investigation into why traces of cocaine were found in the clothing of one of the band members. Police said remnants of cocaine were found tucked away in a tube in an article of clothing when it was being cleaned in the hotel laundry. The private plane that brought the group to Chile from Colombia on Tuesday will be searched for drugs, investigators said. A performance by Guns N’ Roses on Wednesday left about 10 people injured, police said. The group was scheduled to leave Chile for Argentina at noon Thursday but is not allowed to go until the probe is complete, police said. SANTIAGO, Chile - At least five people were hurt and 169 were detained during a concert by the American rock band Guns N' Roses, police said Thursday. Police said hundreds of young fans without tickets tried to break into the Santiago National Soccer stadium for the concert Wednesday night. A 16-year-old girl was trampled and rushed to a hospital in serious condition. A policeman was injured in the head by fans who threw rocks and beer cans at him, police said. Police detained 159 people for reckless behavior, drunkenness, or drug use. 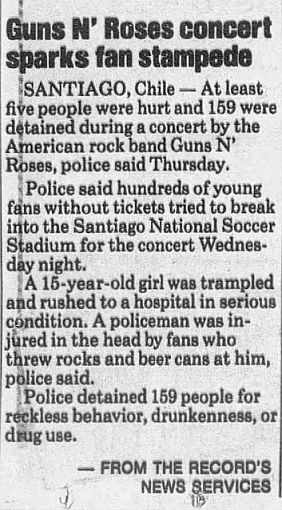 Guns Ν’ Roses arrived from Chile, where 178 fans were arrested at its Wednesday-night concert after violence broke out among the audience, angered by the late start of the show. Rose walked off stage twice and threatened to cancel the concert as bottles and other objects showered the stage. Craig Duswalt wrote: The next day we left for Santiago, Chile. And it didn’t get any easier. Guns N’ Roses went on two hours late that night, and during the show, specifically during the song “Civil War,” bottles were randomly thrown on the stage. No one got hit, and normally Axl would have just left the stage, for fear of getting hit. He had been hit before with objects, as had most of the members of the band. But this night Axl did not leave the stage, probably because he knew something bad would happen. More than 85,000 people were there—the biggest concert ever in that stadium in Santiago. However, unrelated to the show, something bad did happen. Fifty people were arrested outside the stadium, and through no fault of the band, a teenage fan sustained numerous injuries at the concert and died two days later. Rumor had it that she had snuck out of her house to see the concert, because her parents wouldn’t allow her to go. 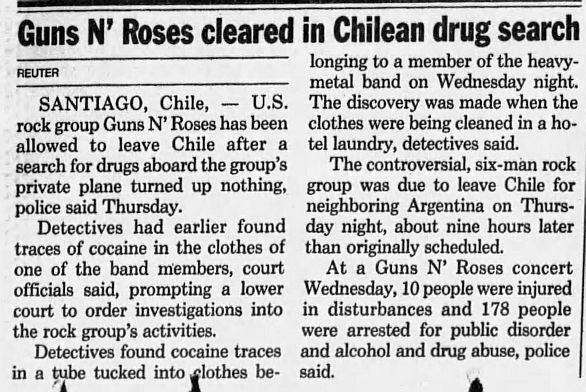 Chilean media reported that Axl was drunk prior to the show. They also reported that drugs were discovered in the band’s hotel rooms. This was not even close to true. Axl very rarely drank on the road. He might have had a glass or two of champagne on occasion, but that was it. Axl hardly drank on this entire tour. He was focused on getting his life straightened out. Plus, both Doug and the manager of the Sheraton San Cristobal hotel denied the accusations. But officials from the Chilean Department of Investigation came to our hotel floor and checked the rooms for drugs. Luckily nothing was found, but that was a scary moment for all of us on the tour. Specifically, when they were checking my room I kept envisioning that someone would plant drugs in my mattress, and that I would go to jail in Santiago for the rest of my life, and Midnight Express came into my mind again. Damn, I hate that movie! I swore the next time a drug search took place in my room, I would be much more prepared. Source: Craig Duswalt, Welcome To My Jungle, BenBella Books, May 2014. Craig Duswalt was Axl's personal assistant at the time. • Guns N’ Roses. Myriam Henríquez Reyes, la adolescente chilena de 15 años que resultó gravemente herida en un recital del grupo Guns N' Roses, murió horas después de que le fueran retirados los aparatos que la mantenían artificialmente con vida, informaron fuentes módicas. La menor fue aplastada por una valla que cayó bajo el peso de una multitud durante la presentación de la banda de rock estadounidense, en el Estadio Nacional de Santiago y desde entonces se encontraba en estado de coma. Los médicos del hospital El Salvador, en cuya Unidad de Cuidados Intensivos (UCI) permanecía ingresada, determinaron hoy su muerte cerebral, tras practicarle un segundo electroencefalograma, cuyo resultado fue negativo. Posteriormente, los padres de Myriam Henríquez autorizaron que le fueran desconectados los aparatos que mantenían activas sus funciones respiratorias y cardíacas. La joven, estudiante de secundaria en un colegio de Santiago, expiró pocas horas después. Miryam, que por primera vez en su vida asistía a un espectáculo de estas características, sufrió una encefalopatía hipotóxica, además de lesiones en la columna vertebral, al ser aplastada por una valla del estadio. 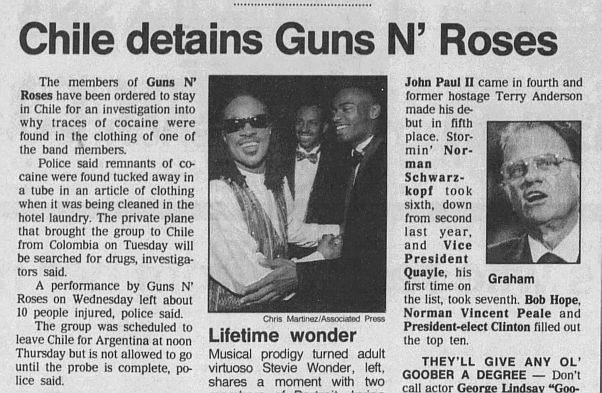 La única presentación de los Guns N' Roses en Chile, en la que según la prensa su cantante, Axl Rose, actuó embriagado y drogado, provocó centenares de detenidos y cuantiosos daños. • Guns N 'Roses. Myriam Henríquez Reyes, the 15-year-old Chilean teenager who was seriously injured at a concert by the band Guns N 'Roses, died hours after she was disconnected from the devices that kept her artificially alive, sources said. The minor was crushed by a fence that fell under the weight of a crowd during the appearance of the American rock band at the National Stadium in Santiago, and was in a coma since then. The doctors of the Intensive Care Unit (ICU) in the El Salvador hospital, where she remained hospitalised, determined her brain death today after performing a second electroencephalogram, the result of which was negative. Subsequently, the parents of Myriam Henríquez authorised the disconnection of the devices that kept her respiratory and cardiac functions active. The girl, a high school student in a school in Santiago, expired a few hours later. Miryam, who for the first time in her life attended a show of this kind, suffered a hypotoxic encephalopathy, in addition to spine injuries after she was crushed by a stadium fence. The only Guns N’ Roses concert in Chile, at which, according to the press, singer Axl Rose appeared drank and drugged, resulted in hundreds of arrests and significant damages.